No, this isn't just another coffee shop. 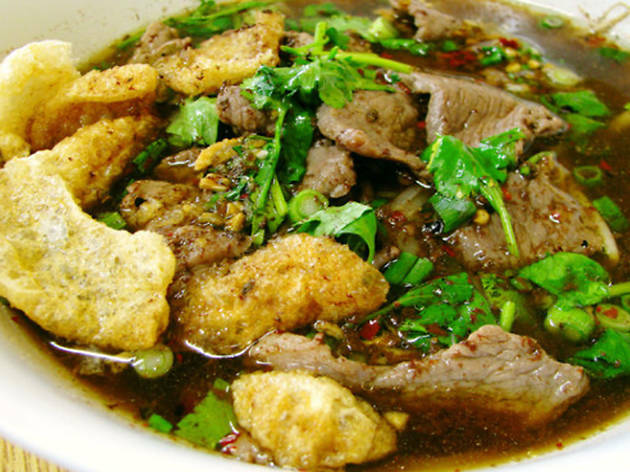 Sapp Coffee Shop is a straight-up Thai food heaven, serving some of the best Thai boat noodles in LA. The jade noodles are another coveted item, while the Thai iced coffee is, of course, a no-brainer. Track this hidden gem down to an unassuming plaza in Los Feliz—you won't be disappointed. 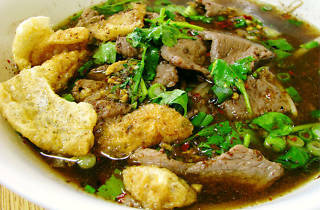 Thai food, particularly the noodles, comprise one of the most comforting, satisfying types of food. Although Sapp Coffee Shop is not open too late, get there before 8:00 p.m. to enjoy super soulful noodles and/or soup. One of my favorite dishes there are the Jade Noodles which are served with toppings of duck, crab and barbecue pork as well as fresh lime, scallions, cilantro, crushed peanuts and more toppings. It is at the same time soft, crunchy, chewy and fresh. Since it is served dry, I add plenty of vinegar from the chili sauce on the table and mix the whole thing up. Another appetizer I enjoy at Sapp are the fried Shrimp Cakes. While they look large and sound heavy, they are made to order and extremely light. The breading appears to be panko crumbs. Their sweet chili sauce on the side offers a great dip. Of course I add a few of the pickled chili peppers and roasted red pepper for even more kick.